July, 2011 - Durham, NH - Nearly 50 riders took advantage of a beautiful summer day to take part in the Southern New Hampshire Dressage & Combined Training Association’s schooling show on July 17 at the University of New Hampshire in Durham. 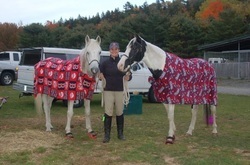 Sponsored by the Holistic Animal Healing Clinic in Exeter, NH, the show was busy, with 80 rides scheduled. Despite the July heat, there were only a few scratches, and the club ran two rings in order to fit all the rides in. The rider and horse pairs ranged from those making their dressage show debut in Intro A, to a few showing at second and third level . Judges Jerilyn Nieder (r) (main ring) and Gail Harrington (Intro) kept busy scoring and providing helpful suggestions for improving future tests. The atmosphere may have been friendly, but competition was tight, with several placings decided on collective marks. The high score of the day was captured by Gale Hepfinger on Devin, riding Intro A with a 72.5%. In Training Level and above, both Kelly Pullen and Deb Deburdo scored over 70% in First Level. Mackie Morgan, riding Just My Luck, was the high scoring junior, with a 66.90% in Intro B. 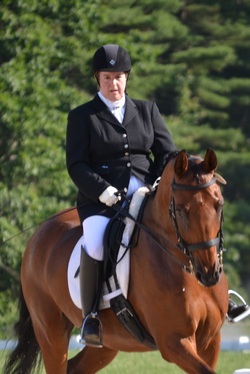 For many riders, it was one of their first dressage shows, and several said they plan to come back for the SNHDCTA Fall Show, which will be held on September 24 at Oak Rise Farm in Goffstown, NH. A huge thank you to show volunteers, including Lisa Smith, Claire Smith, Stefanie Rossetti, Lydia Neusch, Maria Ghigliotti, Erin Cosgrove, Karin Denhard, Elaine Rose, Karen O’Malley, and Sonja Fridell. 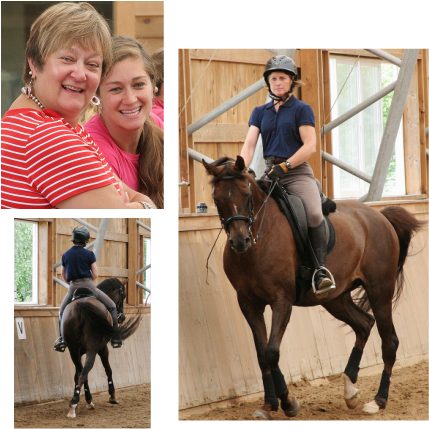 May 23, 2011, Madbury, NH - Last weekend's eventing clinic with Steuart Pittman went off without a hitch. The event was fully booked with private and group lessons in dressage, stadium jumping and cross country. The rain kept dressage riders in, but jumpers braved the elements and took on the often soggy course. Thank you Green Acres for the use of their beautiful facility! If you have pictures of the clinic, please email them to Sonja Fridell. About Steuart: Steuart Pittman is based at Dodon Farm in Davidsonville, MD where he competes his stallion Salute the Truth at Advanced level. He also trains and shows many young horses at the lower levels.Steuart has become a very popular clinician, both locally and nationally, at small barns and at large venues such as the Maryland Horse World Expo. His rates are reasonable, and his style is both effective and entertaining and he enjoys teaching all ages in all disciplines. Check out Steuart's blog here. March 21, 2011 - SNHDCTA members met at the Marion Gerish Community Center in Derry, NH on March 1 for the club's annual meeting and potluck. Members went through general orders of business, indulged in a delicious potluck, and discussed the new 2011 USEF Dressage Tests. New SNHDCTA gear was on display and for sale throughout the evening. Gear included saddle pads, tee shirts bags and polo shirts, all embroidered with the club logo. "L" judge Yvonn Coleman-Larsen treated members to a fantastic discussion on the new USEF tests. February 19, 2011 - Since 2006, the SNHDCTA's virtual home has had the same old look. Recently, members decided it was time for a face lift. 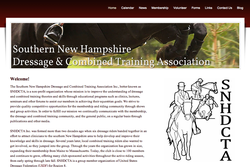 Member Sonja Fridell and SNHDCTA's Board of Directors took on the task of searching for an easy way for members to update the site regularly and give it a fresh look. They decided on the content management system (CMS) Weebly to build a sleek site that's both easy to navigate and simple for multiple administrators to add news, pictures and updates. A SNHDCTA blog was also added to the new site. Members hope to add useful, relevant content to the equine community through the new tool. Guest bloggers are always welcome! 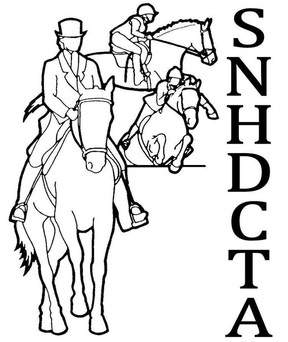 Email Sonja Fridell for information on adding to the SNHDCTA blog. Club members gathered in Manchester for a year end banquet. Awards were given to riders in classes ranging from gaited devision to youth combined training to adult dressage levels. The food was fantastic and the company delightful as usual! An expansive raffle was held throughout the event and members went home with horsey and non horsey prizes alike. Did you or someone you know have something special happen? We'd like to hear about it! Email News at SNHDCTA and we will include your "news" in the SNHDCTA newsletter and on the website.